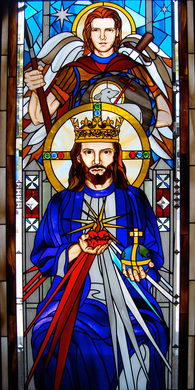 The stained glass in the main section of St. Joseph's Church that is featured in this section was designed and created by parishioner Mary Mullins and all images are subject to copyright, 2007-2010, Valley Rose Designer Glass. Descriptive text copyright Mary Mullins, 2007-2010. You may contact them by calling (209) 238-3236. Before modern times most people could not read well. The Gospel was passed on, in part, by the stories told by the art in churches. Frescoes, icons, statues, and mosiac are just a few of the many venerable forms of Christian art which serves both to inform believers what we believe, but also to enhance worship. 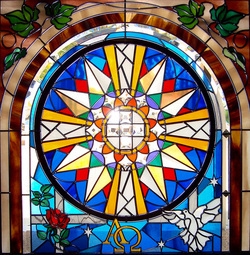 Perhaps the most beloved art form developed by the Church is stained glass which allows light to enter the Church but only by first passing through Christ and His saints. The reason the saints are so important for Catholics is that they serve as shining examples of how to live the gospel message in their particular time, cultural situation and state in life. Both medical doctors and mothers can learn much by modeling their lives on St. Gianna Molla, the mother/physican who gave her live to save her unborn child. Fathers or sons might imitate the Patriarch Joseph or St. Paul. Priests can model their lives after the examples of St. John Vianney, Venerable Fr. Michael McGivney or Bl. Miguel Pro or one of the other priest-saints depicted in our church. The stained glass We hope you enjoy reading about the many lives of the saints on these pages and that you may find inspiration to live your life in imitation of their holiness. Mary, Seat of Wisdom and Queen of All Saints, pray for us! The windows encircling the east and west of the altar and the three windows on the south wall honor the lives of holy men and women whose lives of holiness and virtue lead the Church to believe they are already in Heaven with God. They have survived the time of “great distress” and stand with us around the Table of the Lord as members of the Church Triumphant in the Communion of Saints. Their examples of faith and love inspire us and their intercessory prayers aid us, the “saints” still on our pilgrim journey, as well as those being purified in Purgatory.